(Nanowerk News) The China-UK collaborative effort to support the development an international graphene standards and testing centre was officially launched at Zhongguancun Fengtai Science Park, Beijing, China, in October 2015. As the demand for international standards for testing graphene increases, the Centre in Beijing will lay the foundation for the development of graphene industry and high-end applications in China. A China-UK graphene conference was held as part of the launch activities on the 24 October 2015 and graphene experts from China and the UK's National Physical Laboratory (NPL) discussed graphene R&D progress and the development of graphene international standards; the discussions included NPL's work in this area and the related testing methods. 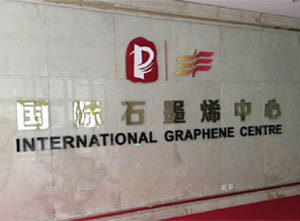 The graphene conference was part of a programme of activities between NPL, Beijing Zhongguancun Fengtai Science Park and the associated Beijing Fengtai New Materials Inspection Institute (BFM) agreed in a Memorandum of Understanding signed in Spring 2015, to support the development of standards and testing in China. Efforts are being made to promote the implementation of standards in China and to introduce new methods of measurement by establishing non-contact and contact-type testing facilities for electrical and structural properties of graphene and other 2D materials at the centre. During the conference, the Chinese Association for Promoting Cooperation between Universities and Industries agreed a strategic cooperation for the centre, which will enable the integration and utilisation of the resources of universities and research institutes. This will lead to knowledge transfer and dissemination of testing standards for the establishment of China's graphene characterisation platform and applications platform. The Vice Mayor of Fengtai District, and Fengtai Park director, Jie Zhang, said that the Zhongguancun Fengtai Park is now actively building an international graphene centre, and that the cooperation of NPL and other international research teams will be instrumental to the success of the centre. NPL's Principal Research Scientist, Ling Hao, added that the partnership with Fengtai Science Park, BFM and other Chinese organisations will be "a win-win collaboration" for graphene research, development and application for both the UK and China. Executive Chairman of the China Industry-University-Research Institute Collaboration Association (CIUR) Prof Wang Jianhua said that graphene international standards and testing is key to national development of a graphene industry. He continued that the China-UK conference will further promote cooperation in graphene research, strengthening resource integration in graphene certification through testing and standards, all will contribute to these exciting R&D developments. Stephanie Kitchen, Andrew Pollard, Tim Prior and Ling Hao of NPL also made presentations at the China-UK conference and delegates from China National Institute of Standardization, Beijing Institute of Metrology, Beijing Institute of Technology gave presentations and many other research and development institutions attended this conference.